We are all looking for ways to save money at home and on vacation in the Orlando area. I've found a terrific source for both. Eversave.com is a deal a day site offering a wide variety of "Saves." Whether you are a local or just a regular visitor to the Orlando area, Eversave Orlando will have a deal for you. I've seen them recently offer everything from discounted spa treatments to inexpensive car washes to reduced price meals to cute kids clothes on the cheap. Add to that Saves on flowers, photobooks, and admission to local attractions. I think 50% off is the lowest discount since I've been watching and I have seen up to 80% off on some items. And don't think that you wouldn't be interested if you aren't a local; you have up to a year to redeem many of the Saves so you can stock up prior to your travels. Personally, I am getting emails from both Eversave Orlando and Eversave Raleigh-Durham. I've really been impressed by the variety and quality of products and services offered. There is a main Save of the day but check your email or the site itself for additional bonus Saves. I love that most Saves are available for 2-3 days to allow you to come back later on those busy days. I was given credits on my Eversave account to use for this review. I've bought three Saves so far and redeemed two of them with online merchants. The purchase process is quick and easy. Redemption generally works like a gift certificate but just check the voucher for the particular vendors' rules. Eversave also gives you easy ways to "earn" free "Save Rewards" on their site. Once you complete a purchase, you are given $2 to tweet, Facebook or email the deal to your friends. I've done this twice and added to my account. On today's email from Eversave Orlando, I received a pleasant surprise, $5 added to my "Save Rewards" account for Mother's Day. Hmmm, what to buy next? Ready to enter to win one of two $25 vouchers to Eversave? REQUIRED ENTRY: Visit Eversave Orlando and comment below on which Save is most appealing to you today. 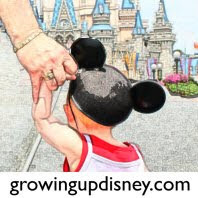 ~Follow Growing Up Disney publicly on Google Friend Connect. See widget at right. This contest ends at midnight Eastern time on Friday, May 13, 2011 and is limited to US residents. The two winners will be chosen at random from all eligible entries. You'll be notified via email (so make sure I can reach you!) and have 48 hours to respond or another winner will be chosen. Good luck! Disclosure: I received credit on Eversave.com for reviewing purposes. No monetary compensation was received or offered. All opinions expressed are my honest thoughts on these products/services. The winning comment #s (determined by random number generator) were #4 and #1. Congrats! The ChicCanvas.com save looks great to me! I would love to have a canvas pic of my little one - preferrably at Disney! I already "like" Growing up Disney on Facebook! I like Growing up Disney on Facebook!